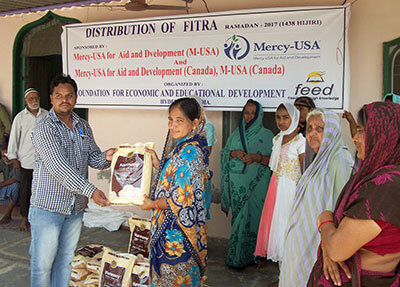 Since 1997, Mercy-USA for Aid and Development has been providing periodic food aid to vulnerable persons in India. Every year, food aid is distributed during the month of Ramadan and subsequent Eid al Fitr holiday. In observance of Eid al Adha, fresh meat is distributed to needy families who often lack a reliable source of protein. Your generous charitable gift supports Mercy-USA’s work in India.